Project obstacles and solutions: In 2012, Roche Diagnostics announced a ten-year, $300 million expansion to their Indianapolis, Indiana campus that serves as their North American Headquarters. This includes multiple new buildings on the 160 acre campus. Messer Construction was hired as general contractor for this project and Broughton Concrete did all of the foundation and deck floors on the new buildings. With this size of a project, staying on schedule and pouring concrete year round is critical. Pours had to be continuous and the mix design had to be precise. Any delays or extra labor costs were a drag on the schedule. The decks were poured during March 2015 when the temperature extremes were fluctuating between highs in the upper 50s to lows in the mid 20s. Typically concrete poured in these conditions would require some form of heating protection, such as insulated blankets and tenting, to guard against thermal cracking and to speed up set times. To keep from using blankets, IMI provided concrete mixed with imix FreezeGuard, a non-chloride mix that accelerates set times and needs no covering. Broughton Concrete was able to pour, screed, float and trowel each 300 yard deck floor in less than eight hours. The crews were able to walk off the job without covering the floors. Using imix FreezeGuard greatly enhanced the initial set to help protect the concrete from freezing. Any saw cutting took place the following day. 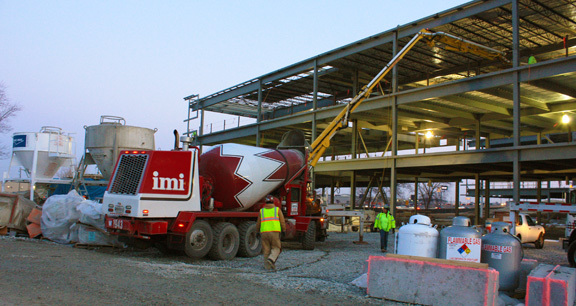 For more information on pouring concrete in cold temperatures and imix FreezeGuard, click here.